In addition to California minimum wage requirements, several cities and counties have enacted their own Minimum Wage Ordinances. Those ordinances set a higher minimum wage for employees who work within their local boundaries. Below is a summary of 2019 changes. Lastly, remember that for all ordinances, you must post the current official, City-provided notice specifying the minimum wage and describing employee rights under the Minimum Wage Ordinance. The notice is available on your City website and must be posted in areas of the worksite where they will be seen by all employees. Typically, they are right next to your State and Federal compliance posters. Ensure that you meet the new minimum wage changes by the effective dates and you maintain accurate records. 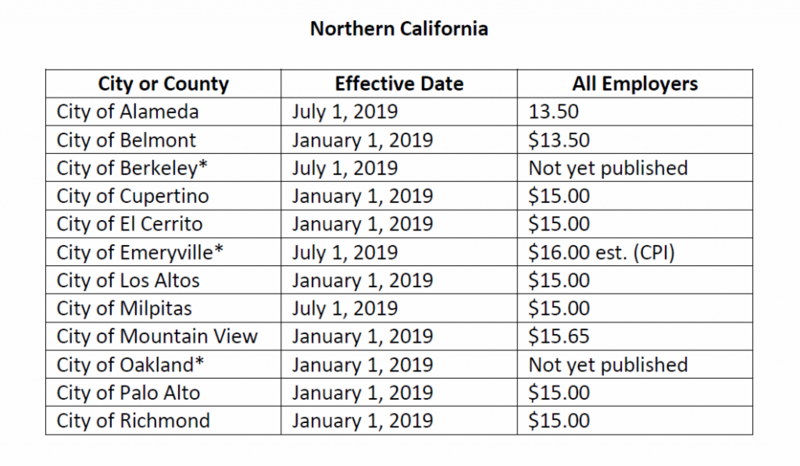 If you have any additional questions regarding these changes and how they may affect your business, or need help obtaining the postings, please contact Human Resource Advisors at 925.310.4824.